I was born and raised in Omaha, Nebraska. I went to Texas A&M University for college but knew I wanted to come back home to Nebraska. I attended dental school at UNMC College of Dentistry from 2012 to 2016. While in Lincoln for dental school, I met my husband Phil. After graduating, I went on to complete my Pediatric Dental Residency at Children’s Hospital in Omaha. I served as chief resident my second year of residency. 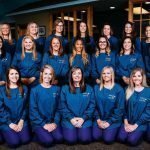 I am a member of the American Academy of Pediatric Dentistry, American Dental Association, Lincoln District Dental Association, and Nebraska Dental Association. In my free time I love to spend time with my family, run, go on walks, and bake.